Often, when the BCC is small, the biopsy itself removes all of it, the area being either left to heal in by itself or repaired with some stitches. Alternatively, if the biopsy shows the BCC to be very superficial but still present, treatment may be possible by surface ointments or by a technique called photodynamic therapy (PDT), in both methods the aim being to kill any remaining BCC cells. For deeper BCCs, radiotherapy is often used with success and with good cosmetic outcomes, and is especially appropriate in more elderly patients too frail for or unable to cope with surgery for other reasons. However, surgical removal (excision) is frequently the treatment of choice, especially in more youthful people, and has the advantage of providing an excision biopsy specimen which can be carefully checked in the laboratory to be sure complete removal has been achieved. A sub-group of BCC, known as infiltrative, morphoeic BCC, is more aggressive and may need quite extensive surgery (sometimes including a technique known as Mohs surgery) for eradication. 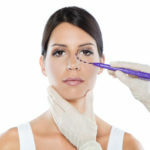 If the raw area remaining after BCC removal is too wide to be stitched together directly, the plastic surgeon uses other specialised methods, including skin flaps and split and full thickness skin grafts, to achieve repair, aiming both to maintain function and to provide best appearance/cosmesis as well.